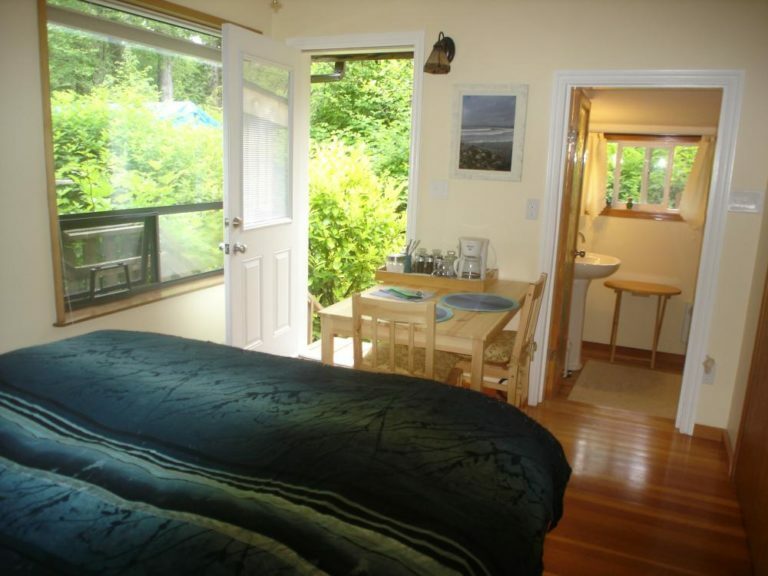 The Sauna House B&B is located only a one minute stroll from the surf, sand and sunsets of Chesterman Beach, and 5 minute drive south of Tofino. Chesterman Beach is a 2 kilometre long beach and is perfect for beach combing, surfing, bird watching, storm watching, kite flying or just relaxing on the sand next to a driftwood log. Take it all in … the smell and taste of the salty air , the feel of the sand between your toes, listening to the rythymic pounding of the rolling surf and often watching the magical fog rolling in and out. On an evening stroll enjoy the magnificent sunsets with the sun sinking into the Pacific Ocean. Walk the beach at night with the moon shadows and here on the coast stargazing is at its best ! Sauna House Cabin: The cabin is small, rustic, cosy cabin tucked in the forest. The main room has a double bed, table/ chairs, a coffeemaker, kettle, microwave, toaster oven, fridge and a hotplate. Off the main room is the washroom and a spacious shower room. After a long day exploring the great outdoors enjoy your private Finnish wood heat sauna. 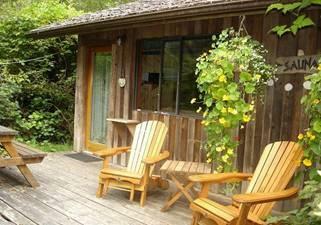 Relax and and soak up the sun on the cedar deck. 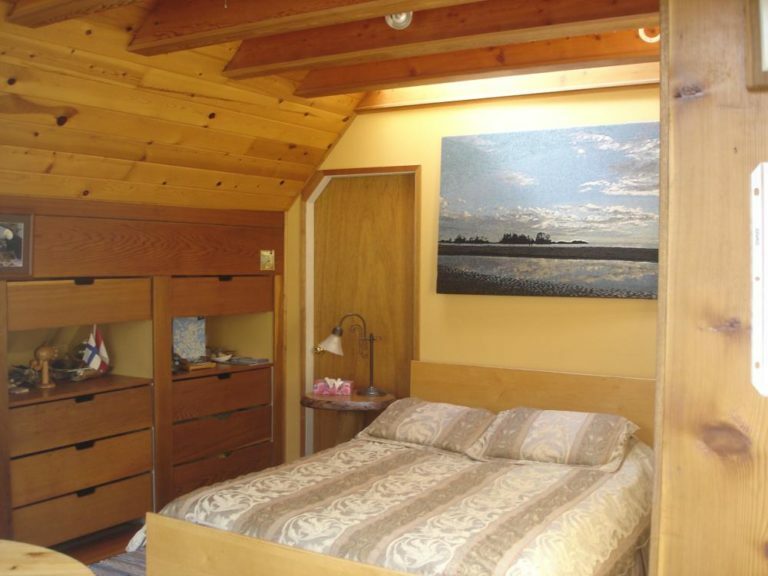 Birdlovers Loft : Up the outside staircase is a private entrance to the loft where you will find a spacious, bright room with wood floors, pine cathedral ceiling and skylight over the queen bed. Private washroom/shower. Table and chairs, Fridge, coffeemaker, kettle and microwave. Watch the birds in the forest out of your large window , reading up on local birds. For Birdlovers and Lovebirds! Sea Dreams Hideaway: An outside entrance brings you into the Sea Dreams Hideaway. 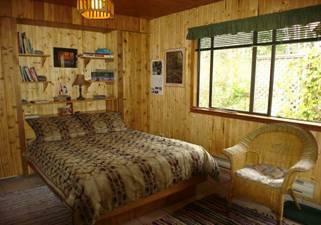 The main room has a queen bed, table and chairs, fridge, coffeemaker, microwave and kettle. Private washroom with shower. Local books and games. The beds are comfortable and you have had the best nights sleep ever, you stretch and then you hear a tap-tap- tap at your door and there awaits a breakfast tray of the most scrumptious kind …. granola, yogurt and juicy, fresh fruit salad. You have made a good choice and this is why you will keep coming back. All beyond your highest expectations?